Looking for something fun to do in the next few days or weeks? You’re in luck! There are always family-friendly events, like those that follow, happening in Chandler. 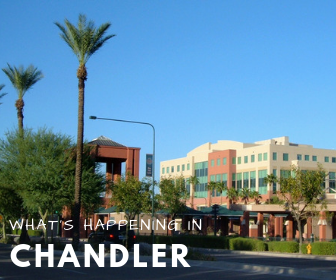 Many of these events are located in beautiful Downtown Chandler which has recently experienced tremendous growth. Many new retail shops and entertainment venues have opened in the area so be sure to check those out while you’re there. The market is open on Saturdays from 8:30 a.m. to 12:30 p.m. through April. Vendors sell fresh fruits and vegetables, locally made jams and baked goods, raw and organic honey, and more. Also, for sale are assorted arts and crafts, as well as beauty products. Support local! Connect with nature during this free 45-minute yoga class presented by FLO Yoga & Cycle. Get your flow on Saturdays from 10:30 to 11:15 a.m. now through February. No yoga experience is required. Be sure to visit the Farmer’s Market before you head out. Namaste yogis! The annual SHE Power Half Marathon & 5K is an event designed to empower women of all ages and abilities (Sorry guys, no men allowed in this one). Celebrate your strength, beauty, and determination…one mile at a time on Saturday, January 27th! It’s all about SHE Power! Anchored in music, movement and community, FitDC is a free 60-minute workout that is appropriate for all fitness levels. Find your fit on Thursday, January 31st, from 6 to 7 p.m. in the heart of Downtown Chandler. Each workout is led by experienced and talented fitness professionals. Science converges in Downtown Chandler for a free Science-Saturday extravaganza, featuring interactive demonstrations and activities by Chandler’s technology companies as well as the next generation of science from the most inventive student STEM projects. Saturday, February 9th, from 10 a.m. to 3 p.m.
Get fired up for the second annual Chili Bourbon Festival on February 16th from noon to 9 p.m. Event highlights include a full day of chili, bourbon, country music, lawn games, interactive experiences, and eating competitions. The competition heats up when local home cooks and chefs go head to head in the chili cook off. General admission is $10 in advance and $15 at the gate. Includes 12 chili samples. Are you experiencing issues with your garage door? Interested in replacing your garage door or automatic opener? Contact Sun Devil Garage Door! Sun Devil Garage Door is a locally owned and operated garage door repair, installation, and service company with a team of experienced professionals serving Chandler and the entire greater metro area. Schedule an appointment today at (480) 600-3762.